Delivery Location: Various locations across the U.S. Results: Provided recommendations that were used in product’s final design; led to contract to retool existing units to accommodate new cap design. High speed centrifugal (rotary) feeder system for liquid laundry detergent caps. Procter & Gamble (P&G) approached Hoosier Feeder Company for its consulting expertise. P&G had designed a new cap to be used on liquid laundry detergent containers with unique characteristics that make it difficult to automate. 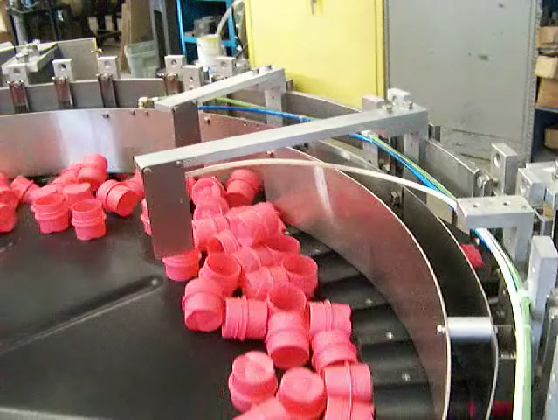 Several months before the product was available on store shelves, P&G gave Hoosier Feeder Company prototype cap samples for testing and requested feedback on cap design and ability to automate before the design of the cap mold and production caps. Hoosier Feeder Company provided several recommendations, some of which P&G applied to its final design. P&G also partnered with Hoosier Feeder Company to bring this innovative cap to market and retool their existing production equipment to accommodate the new design and all current business. Now, every cap on a bottle of P&G liquid laundry detergent in North America goes through a Hoosier Feeder Company centrifugal (rotary) feeder system. Visit our website Feed U to look “behind the curtain” and learn the finer things about feeding systems and the equipment it takes to manufacture the things we use and see every day.